●The hand roller for cleaning record requires no fluids, liquids, cloths, or brushes to remove dirt and debris from your precious record. 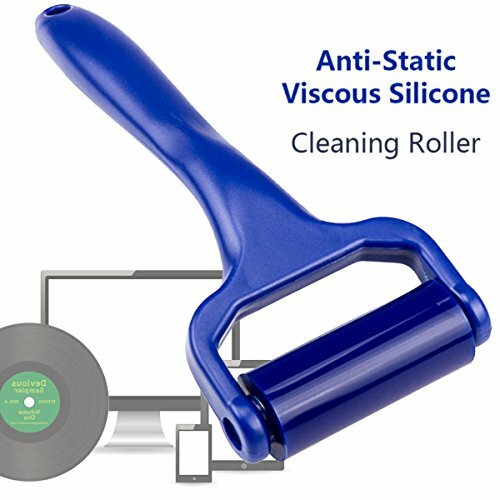 ●This LP deep cleaning roller removes deep-rooted dust and materials from record grooves effectively. You'll honestly be dumbfounded by the amount of "stuff" it picks up. ●The acrylic cover storage will keep roller fresh when not in use. ●You just need to apply a bit of pressure as you roll it over your record and CD to keep them looking bright and new. *Do not apply much pressure and don't touch Esters solvent. *After use please washing it then let it dry. Size: 2 inch Length, 0.87 inch Diameter. Size: 6.30 inch Full Length, 2.56 inch Head Width.